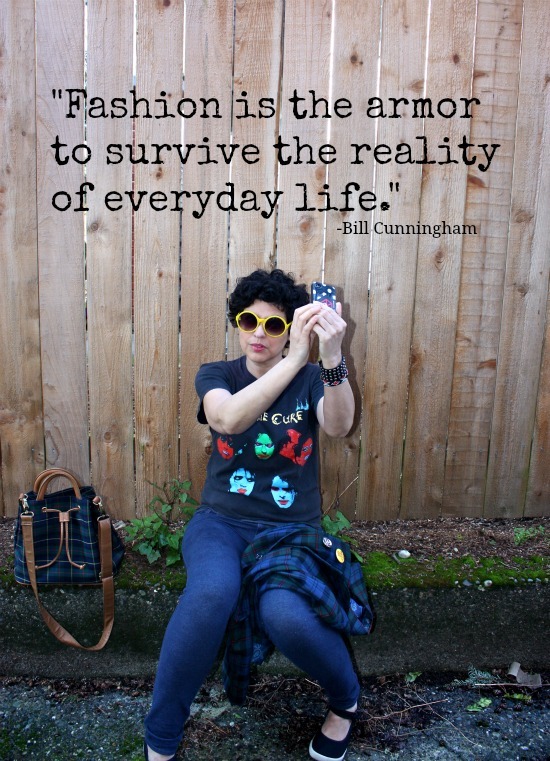 There's a dress shop in my neighborhood that puts a sandwich board on the sidewalk in front that quotes Bill Cunningham: "Fashion is the armor to survive everyday life." Inside the shop, some pretty tasty "armor." The Art of War(drobe): Style Samaurai. Ninja Dandy. Personal Style Gives You Strength to Take on the World. I mean, I could've put on any T-shirt, but I picked THIS T-shirt (a primo vintage Cure concert T) another amazing steal from the boyfriend's closet. And while I needed some sunglasses to protect my eyes from UV rays, the ones chosen were deliberately picked to reference fashion. They're my homage to the inimitable Iris Apfel, "geriatric starlet," and all ages fashion icon. 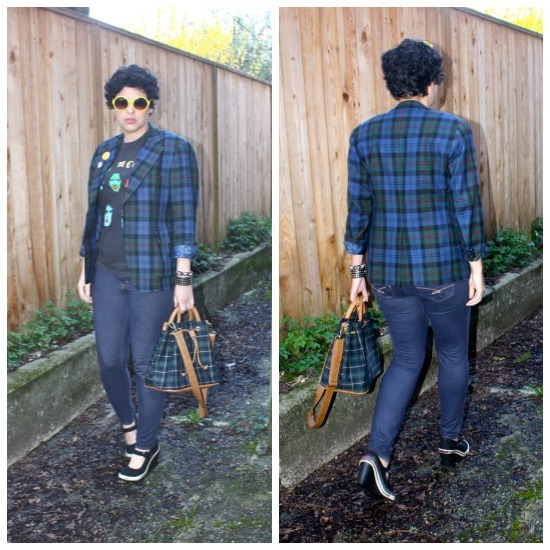 The jacket, a recent score and immediate wardrobe favorite: a blue/green vintage men's wool plaid blazer (with the most incredible hand tailoring details and paisley lining!) along with my trusty everyday handbag, a thrifted Keds plaid tote, because wearing plaid makes me feel like "me." When I feel like me, I feel confident. I like to come off in my way of dress, as an original, a little off center, with an edge of street cred, and a smidge of cool. 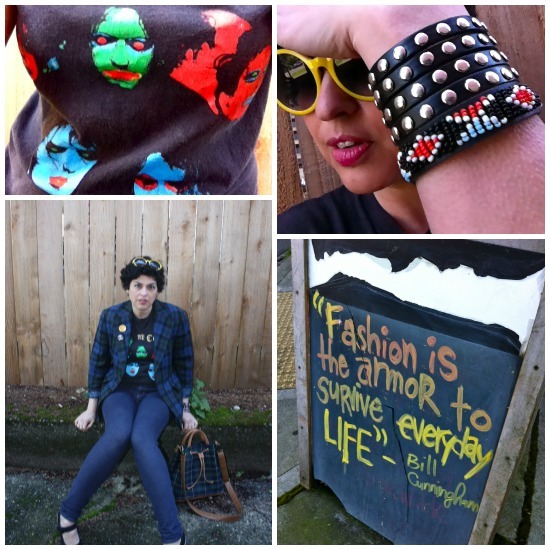 With my Bob Dylan hair, signature punky/beaded cuffs, vintage "flair" and sneaker wedges, I felt all of the above, and very "me," ready to take on the world. What fashions do you put on to face the world? Great concept. Dressing authentically is such a confidence boost!! I put on "pulled together" and "accessorized". When I don't put in the effort...I regret it. You brighten my day! Love those kicks!!! I wear "too much" jewelry and stick something on my head. Makes me less nervous when I go do something new. I'm kind of socially uncomfortable and if I'm wearing something odd, I'll have something to talk about. 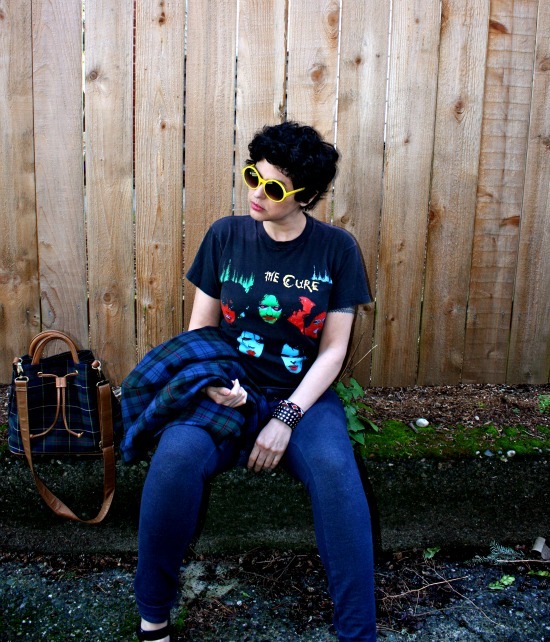 I'm lusting after the tee! What makes me feel like me? Hmmm, having one fun, colourful or dramatic piece that makes a statement. @Reva I LOVE you, Reeves! @Dainty Doll- I know I should sell the shirt, but I got greedy! @Thorne I am so right there with you. Believe it or not, I'm a total dork (well, that is believable) and am social awkward so anything to get a convo going that is not about me, is a good thing. Best sources of inspiration! 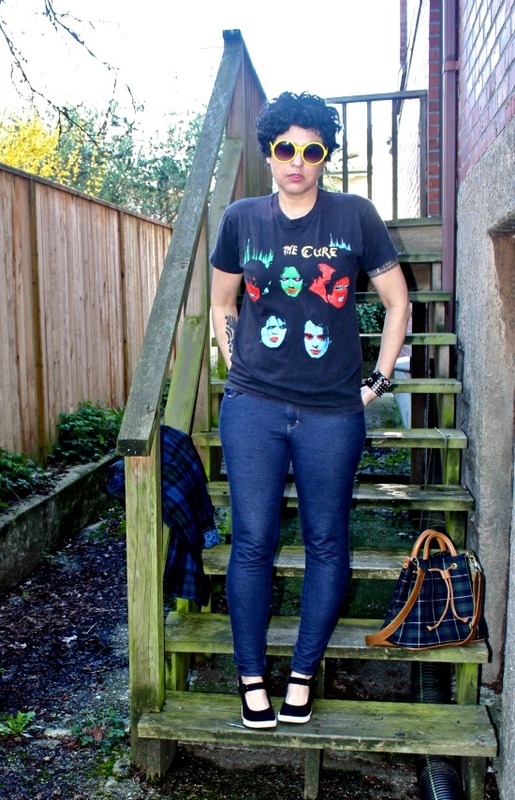 I like it when you dress a little influenced by rock (and of Iris Apfel, of course). Fun Quote...I put on confidence every day to face the world and that confidence is communicated in a variety of ways through my clothing choices. It sounds like a fun boutique! I totally want to see that film now and I am in love with that blazer! That plaid is so You. This strikes me as a very Seattle outfit, which means that conditions are right for you to bloom! When I need armor, I head straight for the boots. And perhaps something black and minimalist. Love the outfit and the quote. I'm sort of in love with Bill C. But I guess who isn't? I want to be edgier than I am! I guess my nod to that is extremely short hair. Armor for me? A blazer. I've felt that way since I was a little girl in my first one--a floral cotton one I had in kindergarten. You look like 'you' and you look totally cool. I feel best when I look like 'me', too (even if that means wearing what is not typically considered my 'best' clothes). Love the tee to pieces. Great video!! You look like a teenager. My daughter in age 13 adores this look, too. the pain of an expensive and great kitchen you will feel only once. The pain of a bad inexpensive kitchen you will experience every day. I had to laugh and thought: if I approach every purchase like that, I would be without any money in no time. Firstly you rock that outfit... Never give him his Tshirt back.. Ever! Oh my gosh you look so COOL! i loooove that quote, i will put it on my moldboard now! and i love the cure, so what else can i say that you made my day with your post ;) also i can´t never get enough of plaids and checks! you look gorgeous! Loved that Cunningham movie. My armor is a hat, of course. You are so you! Love this mix, esp The Cure. I am on a hunt for rock tees lately. how much I'm loving that pretty fabulous trailer, that piece of fashion wisdom!, and how much I'm also loving your plaid jacket, so You, you're really ready to take the world but you're just now rocking my world!! You totally rock that outfit! Love your hair too! I'm usually in work out type clothing and running shoes so I guess that's my armor. And I always wear makeup no matter what! Oh so cute, you edgy, little bit bad, girl. Love that polka dot iPhone case too....I have one and I don't ever want to part with it. That's such a classic outfit! I love the two blue plaids together. I think my armor is fairly similar to yours - a tailored but casual blazer or jacket, jeans, comfy shirt, a few accessories. Dammit, I want to look cool, too, even in my 50s! Smiling over here. I just did a homage for Vivienne Westwood and your the very first blog I clicked on when I finished. And if you ain't livin the Vivienne I don't know who is! You look so very you, and so very cool and gorgeous in that brilliant outfit! Love that blazer! Love the outfit and yes it's YOU!! My armour is bright colors! I knew I commented ;) Have a faboo weekend and LOVE the tee! OMG, I lived in a cure concert tee when I was in high school....to think that now it would be considered "vintage" totally cracks me up. I love Bill as much as I do you! Fashion is my armor but its also my disarmer because I think the way I dress makes people either talk to me or about me. I love this look on ya girl. You look cozy tough and still like hot funky chick. Enjoy the weekend honey! What a perfect and fun post to open up on a Saturday morning! That is one of my favorite fashion quotes! Loved the movie, but it did leave me a little sad for Bill.. as he appeared lonely. You my dear, are so beautifully cool in your outfit! You make me excited to choose my armor for the day! I just adore you Bella! Definitely an outfit post after my own heart! My uniform has been a rock t-shirt with everything, and I love love LOVE your Cure shirt! Even more perfect with the plaid. Fashion is definitely my armor, but more like a superhero, you know? You look so cool; like a mix of Chrissie Hynde and Debbie Harry! I adore Iris Apfel and I read and watched his New York Times fashion/photography column for years.